So, this was the first proper day of work/school for me, and a real test on whether I could make my lunch given my morning time constraints. So, forgive the image quality- I tried to use the “Instant” function button, which should be renamed, “Make a clear photo look washed out with a white border that you will never see on white paper”. Here in my awesome hamburger bento I have a Morrocan style carrot salad with 2 pieces of baked fritata on the bottom layer (first courgette of the season from my garden in said fritata.) 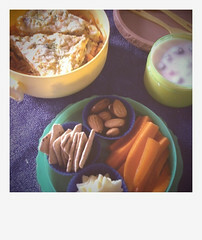 Layer 2 has the “snacky things” – mini crackers with star shaped cheese slices, carrot sticks, and raw almonds. More blueberry yogurt on the side. Comments from my workmates ranged from- “Are you nuts?”, to “Where did you get the star shaped cheese?” (cut out with cookie cutters). It’s all good. 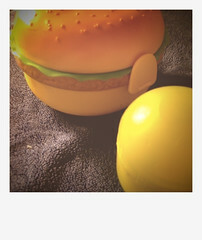 ← Orange you interested in my lunch?